The desire to bring People's, cultures and religions together and especially to draw East and West closer, such is the inspiration behind the production of Ad Vitam Records. The collections under the label comprise vocal and instrumental, classical or traditional music. All the recordings bear witness to the real power of Music, not only as the last bulwark against barbarity, but also as the ultimate expression of the sensitivity of the heart. These are records "For Life". They build bridges of expectation, hope and trust. These wise words are carried on every CD released by a remarkable new record label. I stumbled across Ad Vitam Records by accident recently while browsing in the pilgrim's bookshop at Le Mont Saint Michel in Normandy. Ad Vitam could only be French; it positions itself as 'a label to bring peoples, cultures and religions together' and has been described by the influential Haute Fidélité magazine as 'an extreme audiophile label'. Ad Vitam is the brainchild of Anne Dieumegard and Jean-Yves Labat de Rossi. 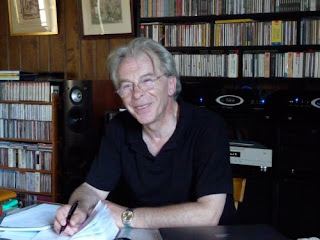 Producer and sound engineer Jean-Yves Labat de Rossi, who is seen below, has a chequered musical history. Born in and educated in France, his first musical love was the organ. But in 1967 he formed the Anglo-French psychedelic band Baba Scholae, whose members included guitarist John Holbrook, before moving to Woodstock in upstate New York in 1970. In Woodstock in 1971 Jean-Yves Labat de Rossi started experimenting with a Synthi-A portable synthesizer produced by EMS. A chance meeting with Bob Dylan's manager Albert Grossman (who also managed Peter, Paul and Mary, the Band and Janis Joplin) led to the release of the young Frenchman's first album in 1973. Grossam decided the name Jean-Yves Labat de Rossi would not play well with non-cheese eating, non-surrendering audiences and suggested the more punchy Maestro Frog, this was humourously abbreviated by Labat de Rossi to M. Frog, and became the title of his first album. Below is the sleeve of the LP which uses the synthesizer notations for the graphic design. 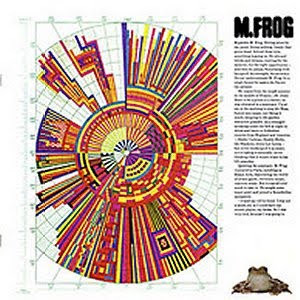 M. Frog was later remixed into discrete four channel sound and became one of Warner Brothers first releases in the short-lived quadraphonic format. In the 1970s Labat de Rossi played synthesizer in Todd Rundgren's prog-rock ensemble Utopia which also included multiple keyboards and brass, and went on to release several solo electronic albums made with leading Woodstock area session musicians. 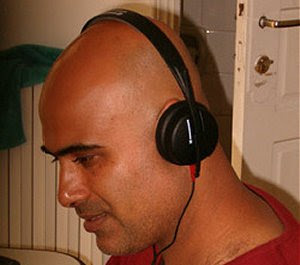 Labat de Rossi worked as a record producer in America in the 1980s and recorded his last electronic album, En Voyage, in 1987. His work as a record producer brought Labat de Rossi into close contact with recording technologies, and at the end of the 1980s, in partnership with former Baba Scholae guitarist John Holbrook, he created HDRS (High Definition Recording System), one of the first portable digital recording systems. HDRS was used to make several pioneering organ recordings and was used for location recordings in Sarajevo and Azerbaijan in 1995 and 1997. 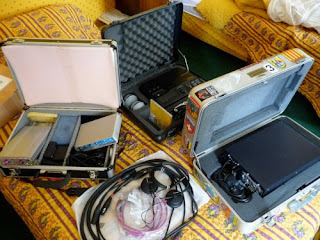 Components of the portable HDRS system are seen below. In 2003 HDRS was used to record the first release for the new Ad Vitam label. 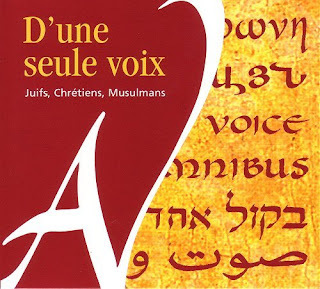 The album's title D'une seule voix - Juifs, Chrétiens, Musulmans, says it all - With One Voice - Jews, Christians, Muslims. This remarkable disc, which is seen below, brings together vocal music from the three great monotheist religions, and all the tracks were recorded either in Israel or Palestine. On the CD Jews, Israeli Arabs, Palestinian Moslems and Christians, Roman Catholics, Greek Melkites and Armenians perform music which comes from very different cultures, but which is linked by the shared desire for peaceful co-existence. As mentioned earlier I came across D'une seule voix quite by chance in the excellent pilgrim bookshop at Mont Saint Michel in France. Never having heard of Ad Vitam records, being sceptical about the current vogue for East/West musical collabarations, and being mindful of the daunting 23.70 euro price I hesitated before making the random purchase. Oh, randomness is a very precious thing! Just a few minutes listening told me that something very special had been captured on this disc. The programme does not try to force diffferent cultures into the paradigm of Western art music. Instead it is a celebration of differing musical styles united by a common humanitarian vision. I played the CD before I read the sleeve notes and was completely unprepared for the demonstration quality of the sound. Location recording usually means sonic compromises, but the HDRS technology perfectly captures the spirit of place as well as the spirit of the music. Some of the magic of D'une seul voix is captured in the video of the project. It is invidious to highlight individual performers on what is a singularly outstanding disc. 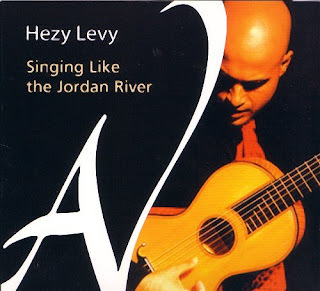 But the tracks by Israeli born Hezy Levy, pictured above, whose songs for voice and guitar combine Western elements with Jewish Ladino and Yemenite styles, led me to his solo album Singing Like the Jordan River, which is seen below. On this haunting disc, which has made many return visits to my CD player, Jean-Yves Labat de Rossi captures beautifully the solo voice of Hezy Levy in the resonant acoustics of the Abbey Church of the Resurrection of Abu-Gosh in Israel. Singing Like the Jordan River will undoubtedly be one of my CDs of 2009. Rather different, but no less powerful, is the CD of Sufi inspired improvisations by the three musicians seen below. 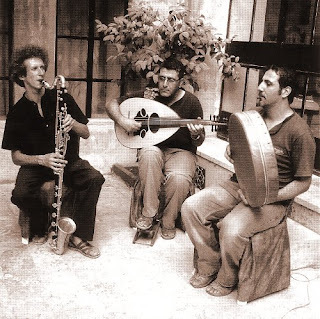 The jazz influenced Bab Assalam brings together clarinetist Frenchman Raphaël Vuillard, who normally plays in early music ensembles, and the Syrian brothers Khaled Al Jaramani and Mohannad Al Jaramani on oud, percussion and vocals. Recorded by Jean-Yves Labat de Rossi in the ancient city of Aleppo in northern Syria in 2008 this CD is important as a musical exploration. But it should also serve a model for aspiring recording engineers; very few recordings these days place the performers securely and believably in an arc between the speakers. There is also a noteworthy CD by the Ensemble musical de Palestine on Ad Vitam, but I will unpack that delicate delight in a separate post. This article was written over a weekend dominated by the shrill media coverage of the BBC Proms appearances of Daniel Barenboim and the West-Eastern Divan Orchestra. I do not dispute that the West-Eastern Divan Orchestra, whose programmes ranged from Beethoven to Boulez, is a wonderful achievement, both in musical and humanitarian terms. But their remorselessly hyped Proms became, for me anyway, yet another case of 'You are shouting so loudly I cannot hear what you are trying to say'. Ad Vitam Records will never achieve the profile or importance of Barenboim and his cross-cultural band. But remarkable things are happening on this fledgling independent record label with its committment to bringing 'peoples, cultures and religions together'. Hopefully, this article will help bring some of the attention this project so richly deserves. 1. Excellent Haute Fidélité article on Ad Vitam. Unfortunately in French and resists machine translation. 2. Background to 1973 album M. Frog. 1. As recounted above, this post originated with a chance purchase of D'une seule voix in France. All the other Ad Vitam CDs mentioned were bought by me online. They are available via Amazon France (resellers have some bargains) or from the Ad Vitam website either as CDs or as downloads. The website also offers excellent quality audio samples. Distribution to retailers is handled by Harmonia Mundi Distribution. I have had no contact or review discs from Ad Vitam Records, but a link to this article has been sent to them for information. 2. The header and footer images have no direct connection with Ad Vitam Records, although they would make rather fine CD sleeves. 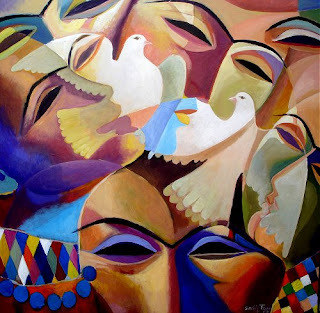 They are acrylics by the Iraqi artist Sadiq Toma, who moved to London in 1978. I came across his work on the same French trip that I discovered the Ad Vitam CDs. 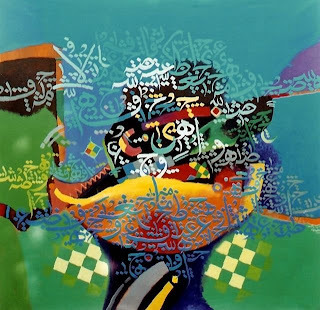 Sadiq Toma was one of the artists whose work was displayed in an excellent exhibition Artistes en exil - Irak (Artists in exile - Iraq) in the public library (Médiathèque) of the small French seaside town of Saint Hilaire de Riez. The population of Saint Hilaire is just 8,767 and it is located 300 miles from Paris. Bearing this in mind try searching their online CD database for, say, John Cage. You can certainly tell the state of a nation by the quality of its bookshops and libraries. 3. I see from their address that Ad Vitam operate out of a restored priory in Saint-Avit-de-Tardes in the beautiful and undeveloped Limousin region of central France. There is a photo of their offices here. I can think of worse places to work. Now read about the secret life of an Arab record label. I was so busy putting this fascinating post that I completely forgot that On An Overgrown Path is five years old today! That is 2098 published posts, I am not even going to try to calculate how many words or images. Sir John Barbirolli's Gerontius plays on the stereo as I type. Life is good. 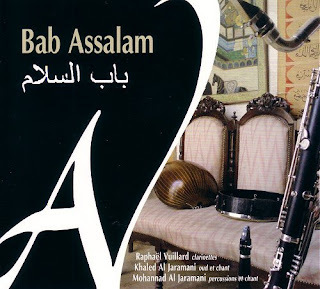 I just checked out Bab Assalam on Amazon. It really reminds me of Castel del Monte (I & II) by Michel Godard. Are you familiar with these albums? Are you familiar with these albums? Congratulations on Path's first five years! That is quite some time for a cultural medium to keep going on as strong and healthy as path does. These lines are to recommend you a very fine piece of writing that was published today in the pitchfork site (I think it is www.pitchfork.com). Its author is Eric Harvey and is called "The social history of the MP3". Please take your time through its five pages, for it is controversial, challenging and enlightening. Oh, how I would like to see this CD in Canada. Reminds me of the Archiv Produktion ‘field recordings’ of the 60’s and 70’s, most notably the Gamelan music of Bali and Java, as well as the recordings from Mount Athos and Zagorsk Monasteries and the incredible Christmas in the Holy Land with performances from the Greek Catholic and Coptic Rites. The sound in these cases, especially the Gamelan recordings, was spectacular. Some of the Gamelan recordings were re-issued on a DG CD, but it whittled down 5 LPs onto 1 disc. Quite a loss of material. Happy Birthday! And a fitting post for it. Congratulations for five years of fine achievement. You've created a wonderful resource, wonderfully presented. Wishing you many more happy years of blogging. OK, 5 years might seem long, in the light of what it still to come it just happens to be a whisper, indeed. Enja.I’ve neb-ver knwn what the word means. However. I knew that label in the 70 & 80 ties. “Enja Records is a German jazz record label based in Munich, Germany. It was founded by jazz enthusiasts Matthias Winckelmann and Horst Weber in 1971, initially devoted to the Jazz avant-garde”. Two fabulous ENJA records are ( I still listen to them once every 2 or 3 months) made by Abdullah Ibrahim, earlier called Dollar Brand. The man was living in exile in Germany. Now he has his small music institute in Cape Town. And a recent discovery, while travelling in the Baltic State ( recorded in Vilnius), is the vinyl record ( 500 copies only) made by a British bassist, Barry Guy, it’s Barry Guy & Mats Gustafsson - "Sinners, Rather Than Saints"
Belated congratulations on five years of Overgrown Path, Bob. Thanks for all the serendipitous paths you've led me down these past few years, not least those signposted in this post, which have already cost me an eMusic album download and one of those Amazon.fr marketplace discs. Specific respect, too, for pointing me in the direction of some obscure but very worthwhile independent labels and for your frequent emphasis on music as what we might very broadly call a spiritual force for good - exemplified by the likes of Jordi Savall and the subjects of this post. Oh, and thanks for keeping on the BBC's case! Keep leading us down those less-travelled roads.